God will never give you more than you can bear. How often have you heard this statement? Did you know that it is not in the Bible? Yet, like many others I grew up in the church believing it. I probably even quoted this misconception to my Lord in prayer! There is one verse that comes to mind (there are probably more) that does not say this, but that is what people want to believe it is saying. This verse is clearly about temptation, the desire to do something against God's will or in disobedience. We are always tempted, so in one respect God has standing orders to resist disobeying Him and promises to not allow the temptation to disobey to be so great that we cannot escape it through Him. I love the quote above because it demonstrates the difference between an unbelieving believer and a believing believer. The unbelieving believer wants to believe that God will not ask him to do anything that is beyond his own abilities. He limits his actions by his own knowledge and talents hoping that God is with him or he is with God...within his limitations. He asks for God to help him. The unbelieving believer prays for sick people with a list of their needs and then ends with "if it is God's will" if not in prayer then certainly within his thoughts. Noah's ark is a great Biblical story of a man who did the right things before there was a Bible. He had a relationship with God and God asked him to do something that was beyond his capabilities and looked absolutely foolish to his neighbors. 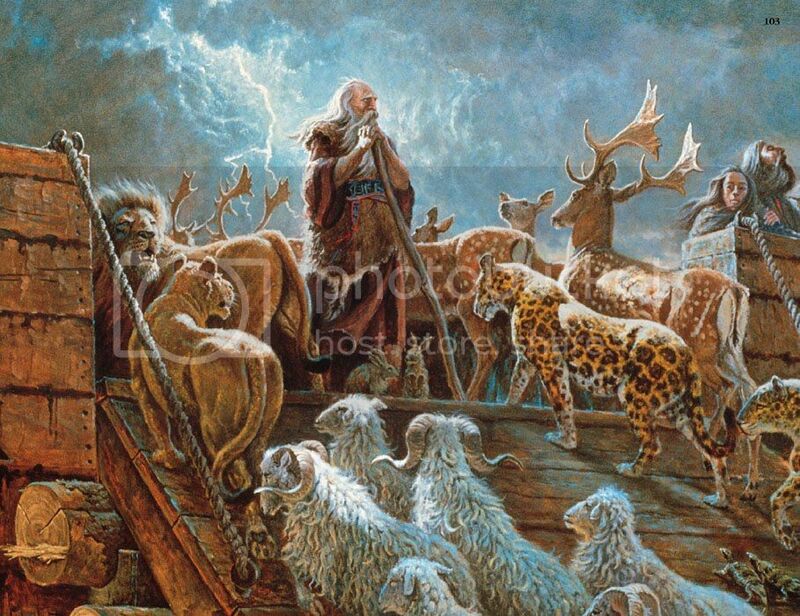 Okay, he might have been able to build an ark, although why would he unless the Lord asked, but gathering two of every kind of animal and not have the carnivores eat the others or any of Noah's family in the process of the gathering before and keeping after the flooding began? That is a miracle in of itself. Noah was a believing believer...without a Bible. Yeah, I am really stressing this point because too many times I have heard it said that all the answers are in the Bible and it just never sets well with me. For centuries men had no Bible and yet the ones who conversed with God were the ones written about in it. The Bible is a guide book that is for this world, but unnecessary in heaven; all the answers are in God and we also can converse with Him directly. The problem with unbelieving believers is how they use and view the Bible can get in the way of them actually conversing with God and doing His will specifically, basically being disciples of Christ in action. I am not saying that the Bible is not worth reading and referencing, but that it should not be your relationship with God, or rather take the place of it. I was an unbelieving believer for first 25 years after I asked my Lord into my heart at the age of eleven, the age my daughter is right now. I know the difference of a surrendered spirit and one who is saved but not yet surrendered. I wonder how many opportunities were missed because I thought I was unable and did not risk on faith, act on faith, as my Lord asked trusting that He was able? How many times have I thought "I believe You can but will You?" How many times have I said "make the way, Lord, and I will go," instead of "I will go to make the way for You, my Lord"? Sixteen years ago, I surrendered to the Holy Spirit and that is when things—really miraculous things, like healings and words of knowledge and more—really began to happen, but I am still learning how use my faith in action. The believing believer is not a flawless person, but one who has a surrendered spirit. He seeks to do whatever God wills, to obey his Lord even when others around him do not understand his actions, think he is foolish, or even that he is wrong. He has the faith that whatever God asks of him will be done through the power of the Holy Spirit. He believes in and even expects to witness miracles. In fact, the more impossible something seems, the more excited he is about what God will do. He does not just have a broken spirit, but one broken open to accept the fire of Pentecost. I don't want to just marvel at the faith-in-action of men like Noah, I want to have that faith-in-action within me.